Nothing truly compares to the elegant beauty of authentic wood blinds. 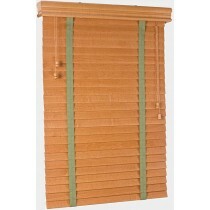 Real wood blinds come in a wide variety of styles and materials. From bamboo to birch or maple, quality wood blinds look wonderful in rooms designed to have a natural wood setting. Authentic wood blinds bring both beauty and class to any room of the house. The downside of wood blinds is that in rooms with high humidity such as kitchens and bathrooms they may warp. However in rooms with direct sunlight wood blinds are able to endure long term exposure to the sun and heat far better than Faux Wood blinds. The other downside is price. 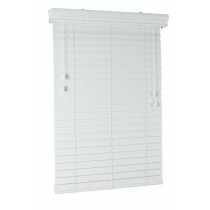 Real wood blinds in addition to looking better and lasting longer than Faux Wood blinds also cost more. This cost can vary based on the type of wood used, and the design. However if price is no object and you are looking for the most beautiful and highest quality of blinds then real wood cannot be beat. Finally at All Star Blinds we recommend real wood blinds made by Caco Inc. Their blinds are manufactured in the USA, and carry a UV rating of 500 that allows them to block more ultraviolet radiation than other blinds. When selecting your blinds it can be important to pay attention to the UV rating. While real wood blinds are excellent for blocking the sun when closed, the added UV protection increases both their longevity and value by offering vital protection from the long term effects of the sun’s rays.